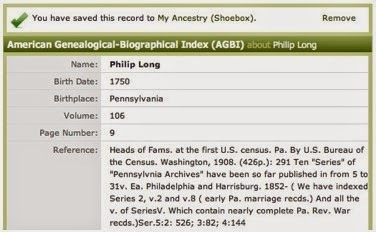 If you’re searching for Philip Long’s origins, your first strategy is to look for a birth certificate that could fit him reasonable well. It’s a sound strategy to begin with. Very soon, you will be dealing with frustration. That shortcut is not turning up the expected results. Been there, done that! It doesn’t take long to realize that even with a certificate on hand, the task of « proving » that it belongs to my ancestor is just as difficult as to find the certificate itself. It seems that this search might never have an end, after all. A birth certificate for Philip Long is not the right one simply because it can be related to his age when he died. The date on the death certificate of Philip is wrong. First, it is an approximation by the priest and he said so on the document. Second, a significant error was also done on his wife’s death certificate some 25 years after. The children of this couple, Philip and Julie, didn’t know the birth date of their parents, so it seems. Consequently, we are looking for a birth certificate with a date that could vary up to a ten-year range. But, even with that extended range, we haven’t been able to find one that could belong to him. I thought that it might be « educational » to present you a few candidates that I have met during my research and explain why I did discard them. At the same time, you might learn how difficult it is to make choices about the faith of each one of them. A Philip Long arrived in Philadelphia, PA, in 1754, on the Neptune commanded by Captain Waire. The boat was carrying avec 400 hundred German passengers. The screen capture below was done from a translation of Ralph Beaver Strassburger’s Index. He was the only Long or Lang aboard. 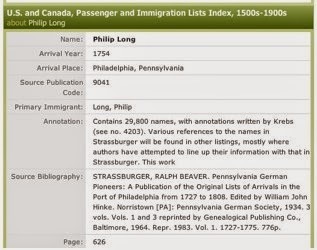 In fact, his name was probably Philip Lang, but became Philip Long as soon he arrived in America. Since his name is on the passenger list, he was at least 16 years old. It also means that he was born before 1936. He can’t possibly be my ancestor. But, he could have become a citizen of Pennsylvania not long after. His name could have been recorded on a census long after. Let’s not loose site of him so quickly. Note. The passenger list tells us also that Philip Long wasn’t able to write his own name. But, there is no indication that he stayed in Pennsylvania. The capture below doesn’t add information to the first, because it was built from Strassburger’s Index. Nothing new is added. Note. If you think that the spelling of the name of Philip Long is crucial to such a research, you’re wrong. Why? First, when an individual can’t read or write, he cannot specify to someone else how to write his name. Second, almost all the Langs from Germany became Longs in America. Their name was « Americanized ». But, sifting through censuses, I’ve noticed that some families kept their name as Lang and they were very consistent across censuses. Here is an example taken from the 1800 Census in Bern, Berks Co., PA.
From 1720 to 1775, German immigrants crossed the Atlantic by the hundreds every year, so much that entire German communities mushroomed during that period. The capture above tells us also that these Longs probably belong to the same family. Their family name was spelled Lang and not Long. From the census, I learn that each one of them has a farm. So, the Philip Lang listed is an adult. No age is given by the census. It is also obvious that Jacob Lang Jr is the son of Jacob Lang. 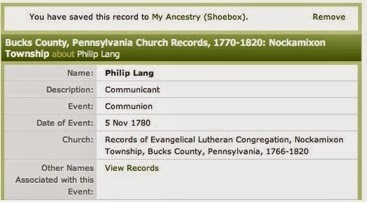 On the same 1800 Census, there is another Phillip Long who lives in Pittsburg, PA. Anyone of these two Philip Long presented could be the same Philip Long who arrived in 1754. Again, no age is given on the census. Philip Long is quite a popular name. There is a third one in Germany, PA in 1800. This Phillip Long appeared on the 1786 Septional Pennsylvania Census (census done every seven years). You have certainly noticed that his neighbor, Henry Little, is also on the two censuses 14 years apart. I’m sure, now, that you are convinced that the spelling of Philip varies and that it represents no concern. Here is a fifth Philip Long from Stoneycreek PA (1800 Census). This one belonged to a well-established Lang family in Heidelberg, PA. I picked up this excerpt from the book, The Long Family in Pennsylvania. The book is available online. This couple had only one child, Louisa. The capture below looks like the perfect candidate to fit in my ancestor’s shoes. The only thing is that he was a Continental soldier from 1777 to 1783. He received a war pension in the 1800s. I know also in what militia Company he was part of. Moreover, he received a Tax Exemption during the time he was garrisoned. He’s, in fact, Number 4. 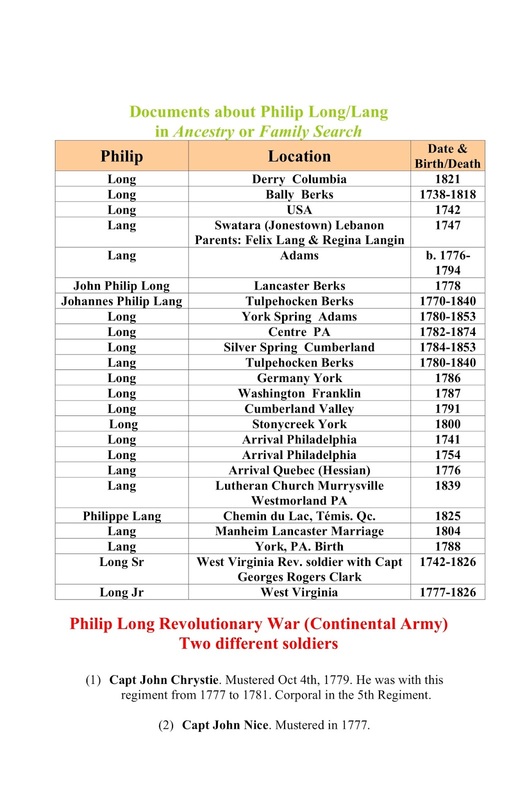 This one is even more interesting, because Philip Long was named executor for the testament of George Lieninger in 1782 in Manheim, York, PA. Lancaster is an adjacent county to Berks. Who’s George Leininger? He lives not far from Philip Long in York County. How many more Philip Long are yet to come? Who cares about unfitting candidates? I want the perfectly fitting candidate! This one is from Kentucky. But, he would be quite old to marry a 16 year-old girl in 1792. Moreover, he was a Continental soldier in the ARW. This soldier is very well known to anybody who has surfed Ancestry.com or LDS. He stayed and died in Shannandoah after the ARW. Here are two captures about him and his family. It doesn’t take much time to discard him. I don’t think he left his properties behind to become a courier in Canada. There is one more in Pennsylvania. He was married to Catherine and they had a child in 1759. He could be Number 4 who got married after his arrival in 1754. This couple could also have had a son by the name of Philip. Who know? How about another one? This one could correspond to one of the above. I have noted and mentioned that many Langs were Lutherans. A member of my family identified this Philip Lang, in 2010. Recently, I saw the same birth certificate on a LDS microfilm. Regina Lang died in Annville in 1820. 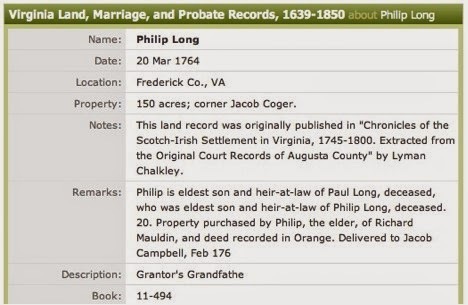 Since 2010, it has been publicized as Philip Long, the son of Felix Long and Regina Langen of Abbotts Creek, Rowan Co., NC. He doesn’t belong to this family. With a member of this southern Long Family, we were able to discard him as member of her family. This capture shows what has become of Philip Lang baptized at the Hill Church in Annville, Lebanon. Philip Lang was not born on August 2nd, but rather baptized. This individual could correspond to a few ones of the list presented. Some years ago, I found this individual in Lansallos, England. Because some believe that Philip was born in 1742, they consider him as a major candidate. Personally, I wouldn’t bet five cents on it! I assume that, if you have read various sections of my blog, you realize why these candidates have no value for me. 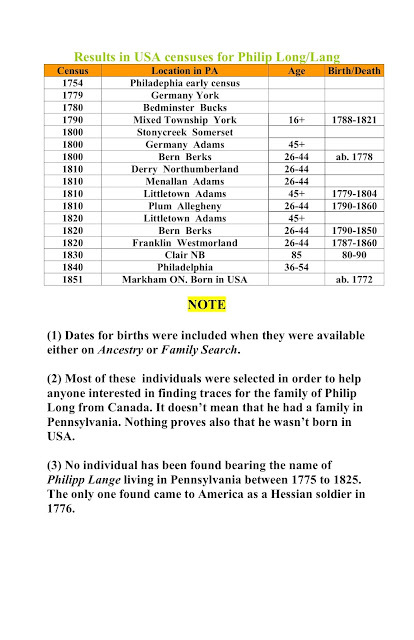 I have found as many documents as possible showing a Philip Long/Lang in Pennsylvania and elsewhere for the period of 1720 to 1820. They are from Ancestry and Family Search.